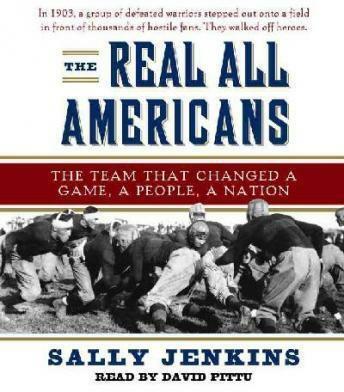 Sally Jenkins, bestselling co-author of It's Not About the Bike, revives a forgotten piece of history in The Real All Americans. In doing so, she has crafted a truly inspirational story about a Native American football team that is as much about football as Lance Armstrong's book was about a bike. If you’d guess that Yale or Harvard ruled the college gridiron in 1911 and 1912, you’d be wrong. The most popular team belonged to an institution called the Carlisle Indian Industrial School. Its story begins with Lt. Col. Richard Henry Pratt, a fierce abolitionist who believed that Native Americans deserved a place in American society. In 1879, Pratt made a treacherous journey to the Dakota Territory to recruit Carlisle’s first students. Years later, three students approached Pratt with the notion of forming a football team. Pratt liked the idea, and in less than twenty years the Carlisle football team was defeating their Ivy League opponents and in the process changing the way the game was played. Sally Jenkins gives this story of unlikely champions a breathtaking immediacy. We see the legendary Jim Thorpe kicking a winning field goal, watch an injured Dwight D. Eisenhower limping off the field, and follow the glorious rise of Coach Glenn “Pop” Warner as well as his unexpected fall from grace. The Real All Americans is about the end of a culture and the birth of a game that has thrilled Americans for generations. It is an inspiring reminder of the extraordinary things that can be achieved when we set aside our differences and embrace a common purpose. I enjoyed the book. Lots of things I didn't know. I felt that the author filled the book with things that didn't assist in telling the story, but still well worth the time. i thought this book was about Jim Thorpe, but it was more on the history of the Carlisle Indian School and its football team. Regardless, it was wonderful! Fascinating book. I learned a lot of history and lots about football.